Press play to hear from Goldman Sachs 10,000 Small Businesses Graduates. Goldman Sachs 10,000 Small Businesses is a $500 million investment to help entrepreneurs create jobs and economic opportunity by providing them with greater access to education, financial capital and business support services. Led by Co-Chairs Warren Buffett, Michael R. Bloomberg and Dr. Michael Porter, the program is a public private partnership to unlock the growth and job creation potential of small business owners across the United States. The 10,000 Small Businesses program currently operates in 30 markets in the U.S. through a network of more than 100 academic and community partners, and the program continues to expand on a city-by-city basis. In Maryland, the Goldman Sachs program is funded by Goldman Sachs and the Bloomberg Philanthropies and is facilitated by Morgan State University, Johns Hopkins University and the Community College of Baltimore County. Will Holmes is responsible for Outreach in the State of Maryland. Click here to schedule a call with Will. Small business owners learn how to become more bankable and position their businesses to access financing and capital. 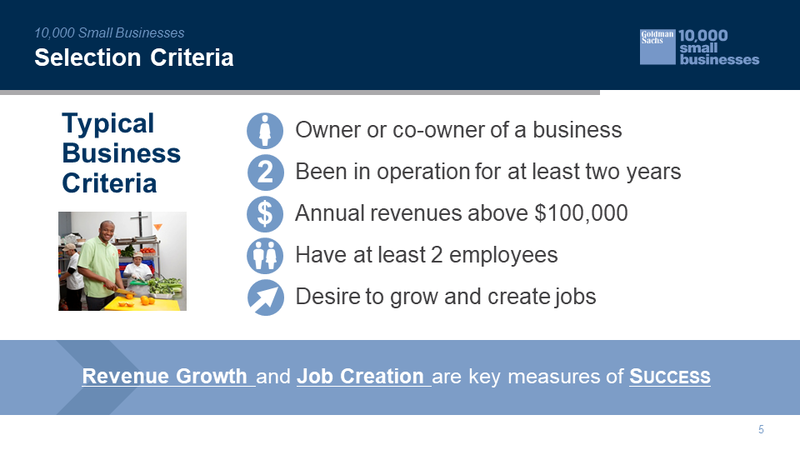 Through partnerships with local, regional and national Community Development Financial Institutions [CDFI’s] and other mission-driven small business lenders “Capital Partners”, loans are available to qualifying small businesses that lack access to affordable capital or may not qualify for traditional sources of credit. Why is Goldman Sachs doing this? The idea is that if we can identify companies that have been doing well, give them the information they need to identify their challenges and build a solid plan for growth, they will increase revenues and hire more people. This will reduce joblessness, increase the tax base, create more stable neighborhoods and strengthen the local economy. First, there is a tremendous time commitment. Scholars are in class one full day per week and often meet outside of class to work on their growth plans and share ideas with the other scholars and their assigned business advisor. Second, once you graduate, we ask that you refer other qualified businesses owners so they can benefit also. Third, once you graduate, we ask that you report your progress back a few times a year so that we can ensure that you are growing and that our program is being effective. The program is intense and it is working! 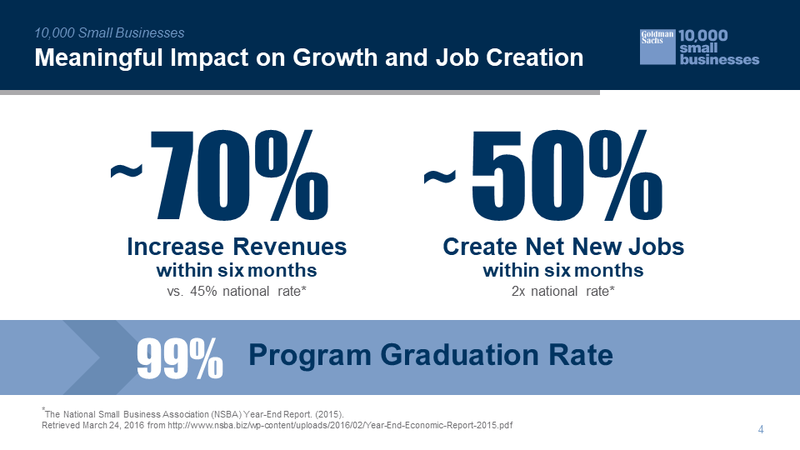 Across the U.S., graduates are increasing their revenues and creating new jobs in their communities. Your investment is your time. But, the returns are a more sustainable business, higher revenue, the opportunity to employ more people in your community and a new network of thousands of graduates across the country. 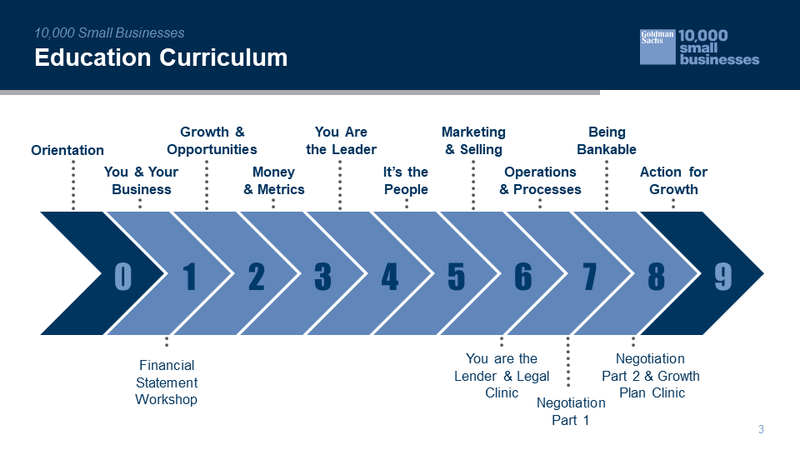 The Goldman Sachs program teaches business owners how to work ON their businesses instead of working IN their businesses. Plus, upon graduation, business owners have a better understanding of what is needed to attract investors and lenders when pursuing capital to grow their businesses.